Our staff is trained to apply lashes by NOVA LASH Inc.
Nova Lash lashes are an individual or cluster lashes with different lengths and widths. 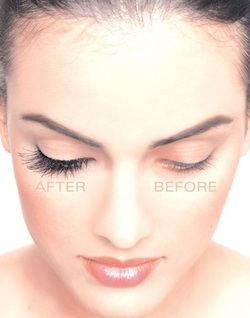 The length and width are specifically chosen to accentuate your own natural lash. This helps the lashes wear comfortably and long lasting. Maintaining the health of the natural lash is our priority. Over applying and heavy lashes can pull or break your own lash causing future damage. For a special event or just to give it a try! Curls and lifts your natural lashes for 6 - 8 weeks! ​To enhance the color of the lashes and eyebrows. We use a high quality safe for eye vegetable base dye. *Colors range from auburn, warm brown, blue, deep black or graphite! Mineral Makeup and brushes for application and retail. Performed by Certified Makeup Artists. Shop for New Colors ~ Complimentary! Call ahead if you are interested in picking out some new colors. We will ensure that a professional will help you with your selection. We offer a wide variety of foundations & powders, brow shaping & shading, eyes and lips.